A firefighter works a burnout operation on the north flank of the Fontenelle Fire outside Big Piney, Wyoming, on Wednesday, July 4. More than 800 firefighters are working 15-hour shifts battling the fire that has exceeded 56,000 acres, according to fire information services. Trees smolder and burn on the north flank of the Fontenelle Fire. The crews are working and sleeping close to the fire in an effort to contain it. Firefighter Ryan Christian sits with his crew from Alaska before heading out to fight the Fontenelle Fire outside Big Piney. The blaze, burning in dead and thick stands of timber, started on June 24 and is 15% contained. Firefighter Alex Abols monitors fire on the north flank of the Fontenelle Fire outside Big Piney. Record fire danger and long stretches of the red flag warning days have made it challenging to control. 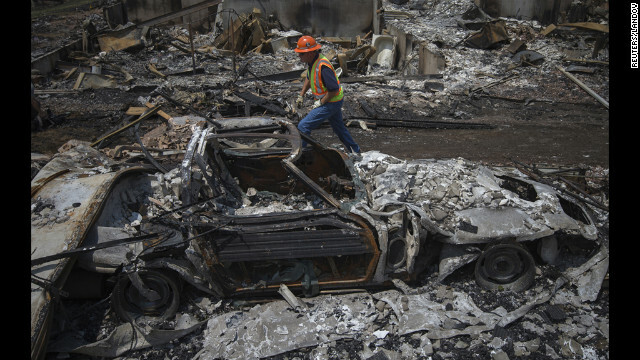 A utilities worker walks past the skeleton of a vehicle on Monday, July 2, while searching for gas leaks in a Colorado Springs community ravaged by the Waldo Canyon Fire. 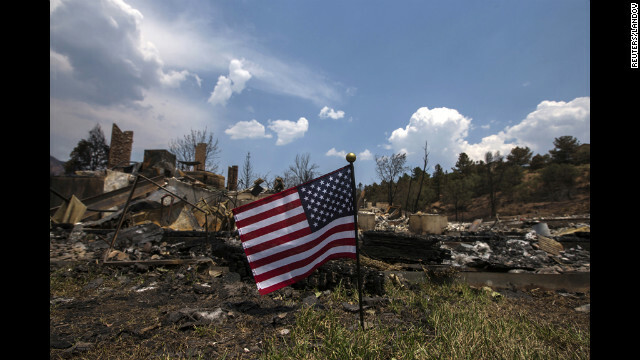 An American flag waves Monday in front of a house leveled by the Waldo Canyon Fire in Colorado Springs. Residents began returnning to the area on Sunday after the fire forced thousands of people from their homes. 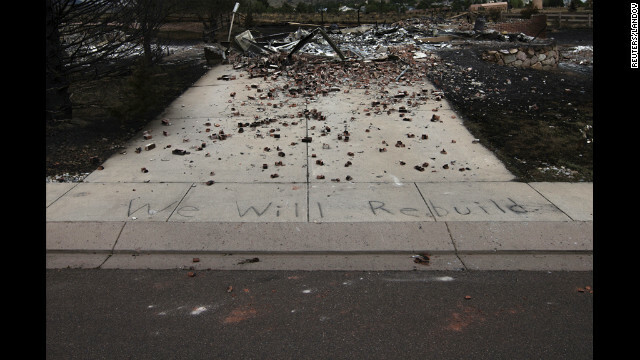 The words "We Will Rebuild" are seen written on the sidewalk in front of a house in Colorado Springs that was destroyed by the fire. 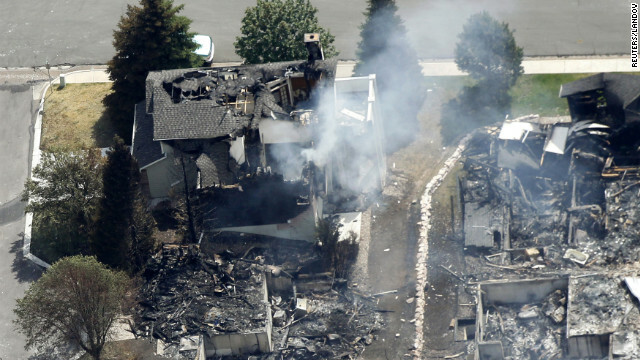 Fire-destroyed homes are seen in the Mountain Shadows neighborhood in Colorado Springs, where hundreds of residents were given an eight-hour window to visit their properties on Sunday, July 1. 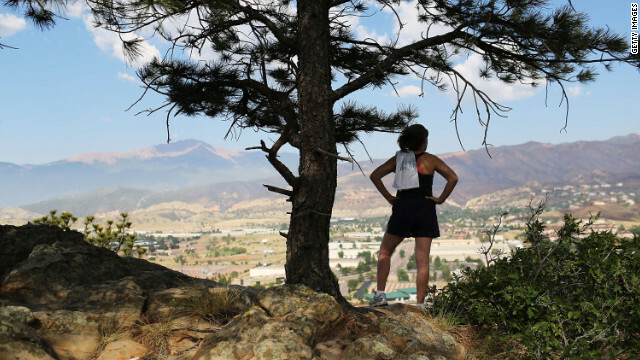 A jogger on Sunday looks out over neighborhoods in Colorado Springs that were evacuated due to the Waldo Canyon Fire. The massive fire has destroyed hundreds of homes and forced more than 32,000 people to flee. 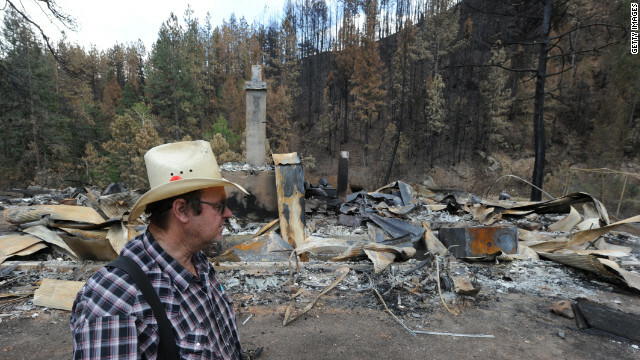 Frank Baker visits the remains of his brother's home in Bellvue, Colorado, on Saturday, June 30. The house was burned to the ground in the High Park Fire. 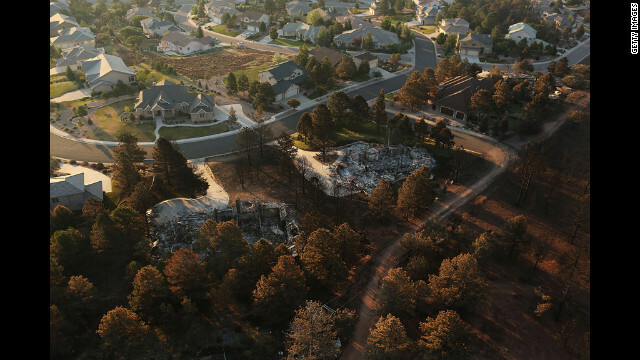 Homes destroyed by the Waldo Canyon Fire are seen from the air in a Colorado Springs neighborhood on Saturday. Damaged cars line the curb in front of ruined houses in Colorado Springs. 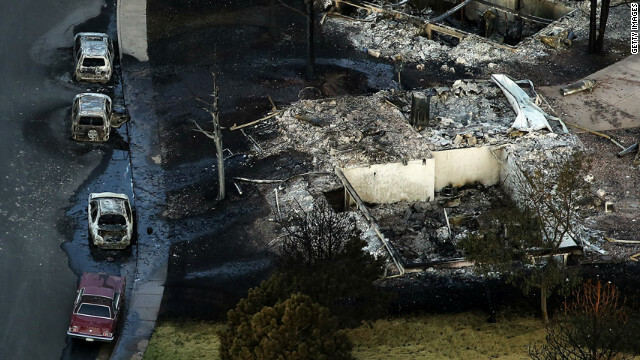 The line of fire damage is clearly visible in this Colorado Springs neighborhood. 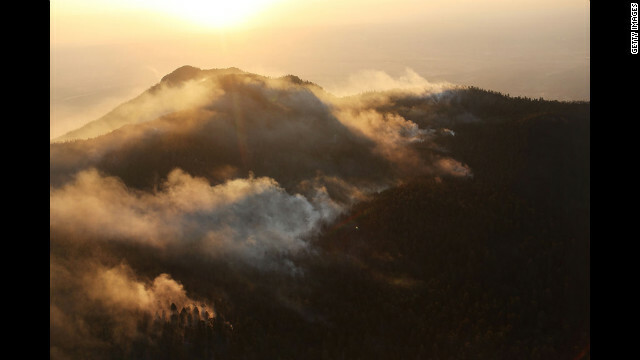 Smoke billows at sunrise from part of the Waldo Canyon fire in Colorado Springs. 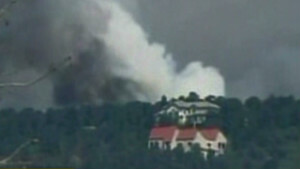 One home stands surrounded by others destroyed by the Waldo Canyon fire in Colorado Springs on Saturday. 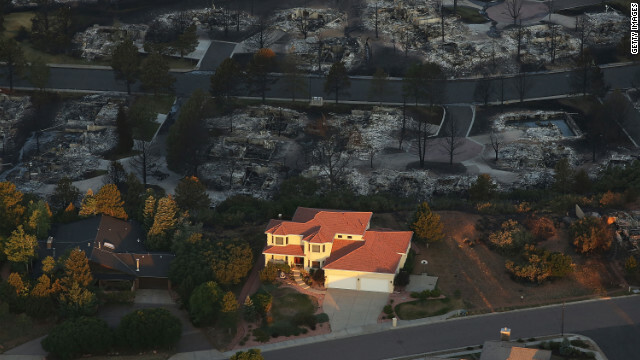 Homes burned to the ground by the Waldo Canyon fire are seen in a neighborhood in Colorado Springs on Saturday. 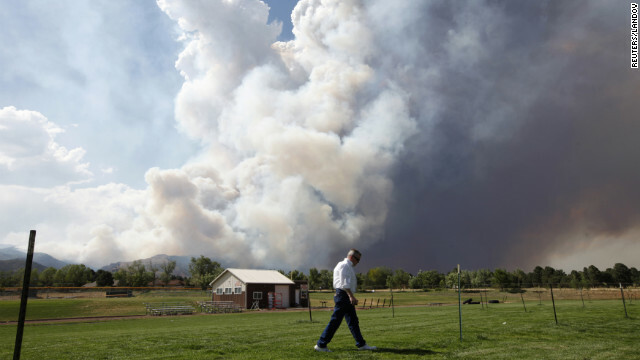 The fire, which has burned more than 15,000 acres, began spreading to the southwestern corner of the Air Force Academy in the early morning, causing base officials to evacuate residents. 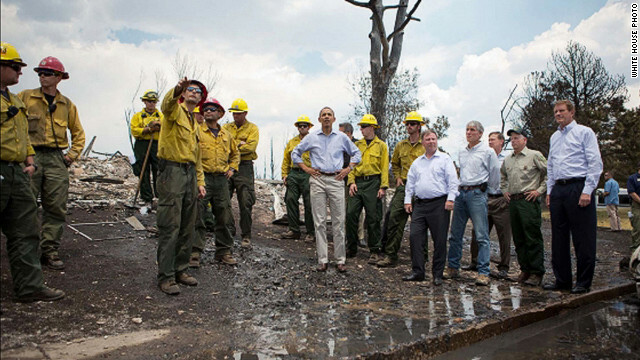 President Barack Obama tours fire damage with elected officials and firefighters in the Mountain Shadows residential neighborhood in Colorado Springs on Friday. 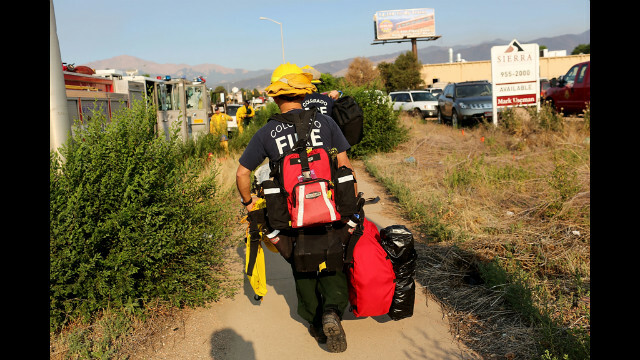 Firefighters get ready to tackle the Waldo Canyon Fire on Friday. 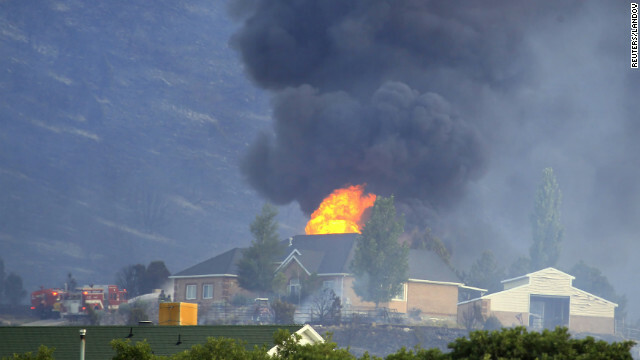 A house is engulfed in flames as fire crews fight to contain it at the Rose Crest fire in Herriman, Utah, on Friday, June 29. Crews are fighting to contain six separate blazes in the state. 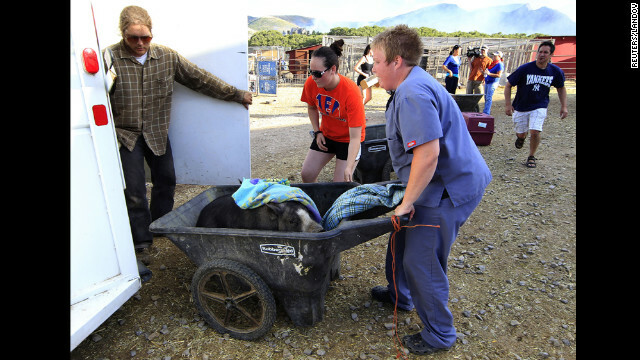 A pig is evacuated in a wheelbarrow from the Ching Family Animal Refuge in Herriman, Utah, as the wildfires worsen on Friday. 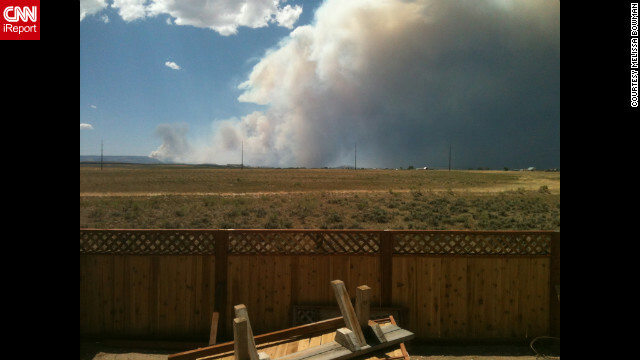 Melissa Bowman, a CNN iReporter from Big Piney, Wyoming, captures the Fontenelle Fire close to her home as she waits for an evacuation notice. A camp for firefighters is set up at Holmes Middle School in Colorado Springs on Thursday, June 28. 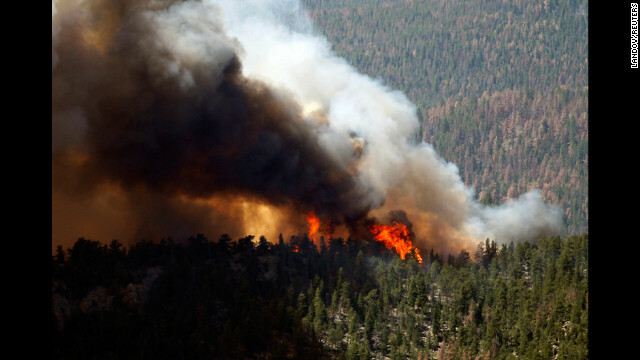 The Waldo Canyon Fire has scorched more than 16,700 acres. A partially burned home smolders Thursday in Colorado Springs. The line where the Waldo Canyon Fire stopped moving east is seen from the air in Colorado Springs. Lower temperatures and lighter winds helped firefighters on Thursday in the battle against the fire. 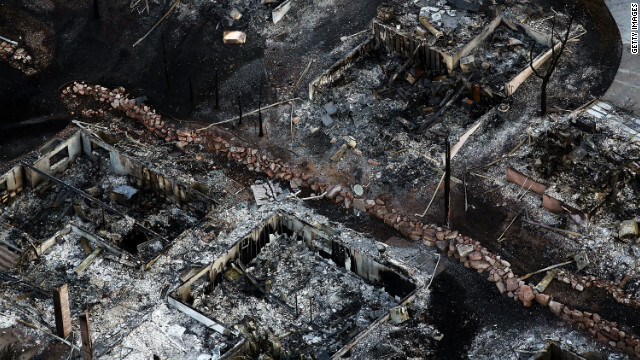 An aerial view of a destroyed neighborhood in the aftermath of the Waldo Canyon fire in Colorado Springs. 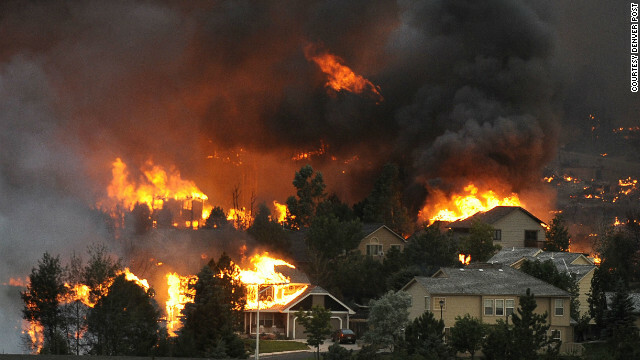 The Waldo Canyon fire spreads through a neighborhood in the hills above Colorado Springs on June 26. See more photos at The Denver Post. 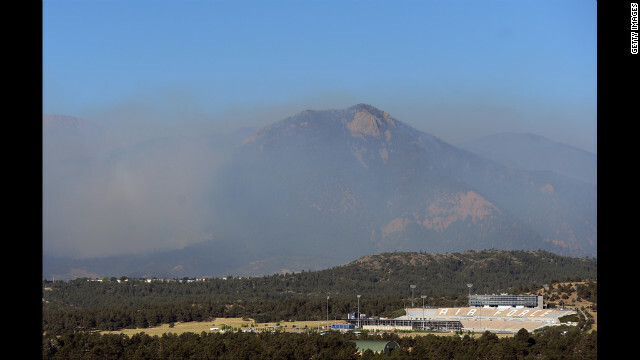 Hazy smoke from the Waldo Canyon Fire looms behind the Air Force Academy stadium on Wednesday, June 27, in Colorado Springs, Colorado. The fire expanded to 15,000 acres. More than 32,000 people have been evacuated. 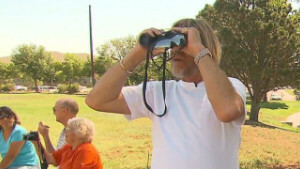 Susan Custer and her husband, Gary Custer, watch the Waldo Canyon Fire on Wednesday. 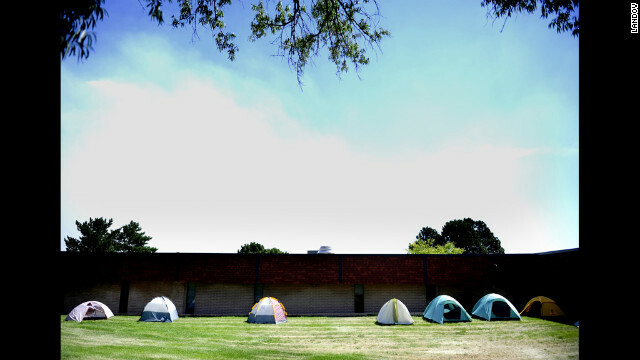 At dawn on Tuesday, firefighters stir from their tents at a camp near Holmes Middle School. 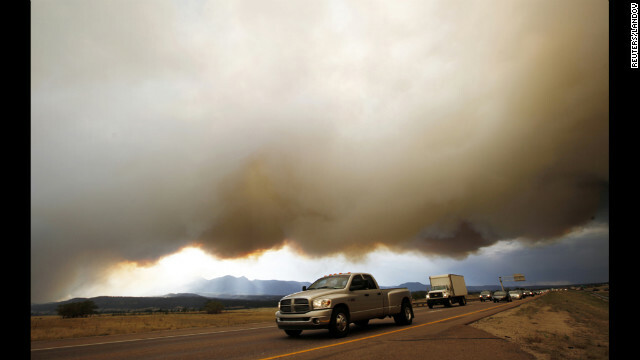 Smoke billows from the Waldo Canyon Fire west of Colorado Springs on Tuesday. 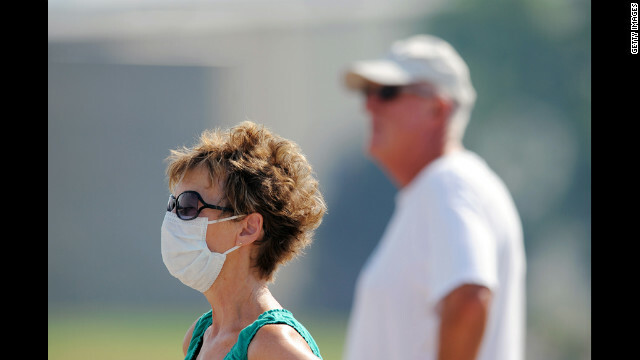 Evacuees drive under a shroud of smoke from the Waldo Canyon Fire on Tuesday. J'Amie Sirvaitis of Colorado Springs watches the Waldo Canyon Fire after winds pushed the fire into the Mountain Shadows neighborhood in Colorado Springs on Tuesday. 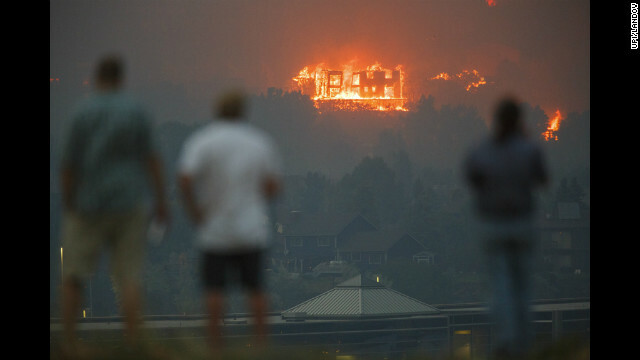 Residents of Colorado Springs watch as the Waldo Canyon Fire burns a home in the Mountain Shadows neighborhood on Tuesday. 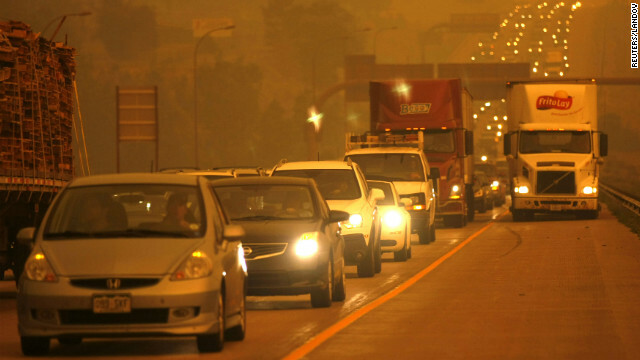 Smoke from the Waldo Canyon Fire engulfs Interstate 25 north of Colorado Springs, Colorado, as the blaze burns out of control Tuesday. A large plume of smoke from the Waldo Canyon Fire fills the sky west of Colorado Springs on Tuesday. 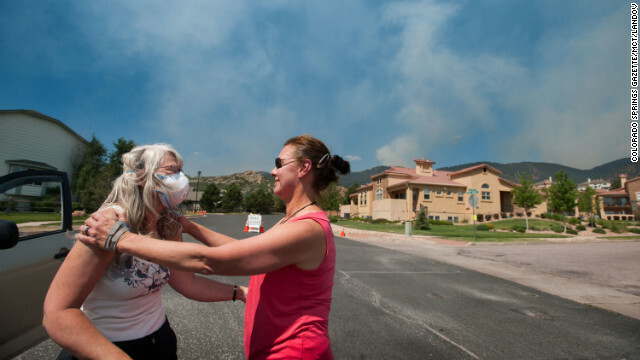 Jan Stone, right, comforts Angela Morgan as smoke from the Waldo Canyon Fire pours over the Mountain Shadows neighborhood of Colorado Springs on Tuesday. 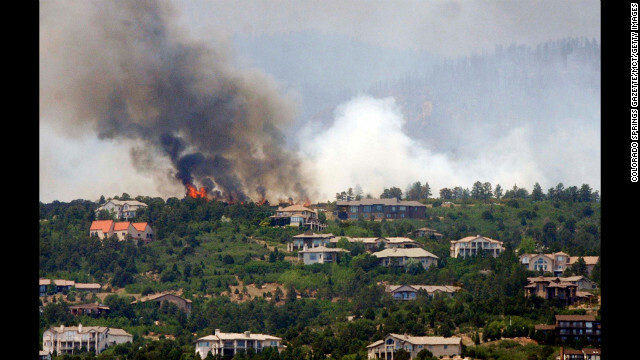 A portion of the Waldo Canyon Fire moves across a hillside above a subdivision west of Colorado Springs on Tuesday. 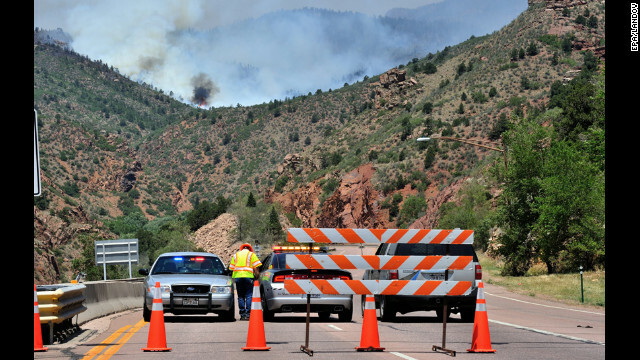 Colorado State Patrol and Colorado Department of Transportation personnel set up a roadblock west of Manitou Springs, Colorado, on Monday, June 25. 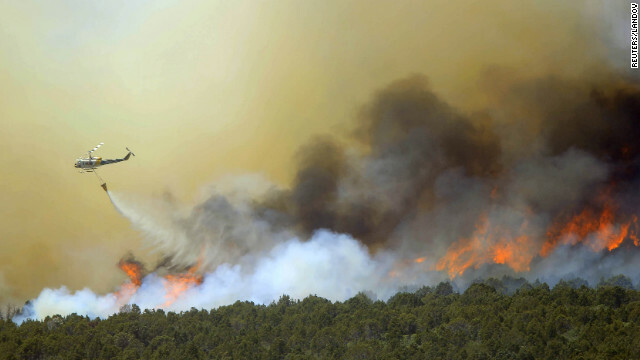 A portion of the Waldo Canyon fire burns out of control in the hills west of Manitou Springs on Monday. 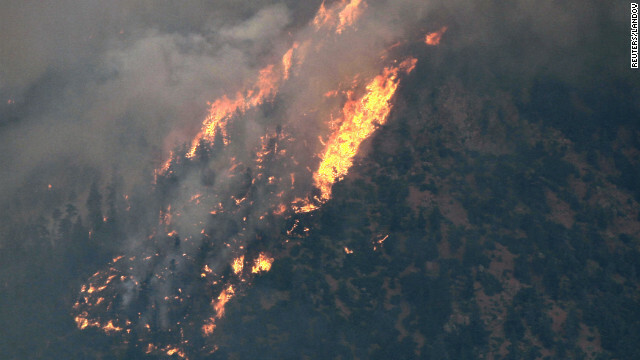 Trees burn on a ridge above Cedar Heights in Colorado Springs, Colorado, on June 24. 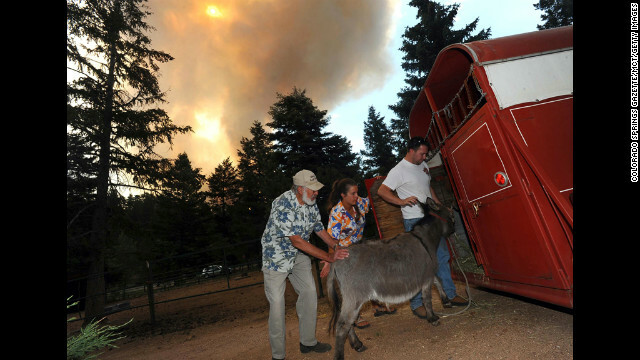 Greg and Karen Bodine help her father, Duane Schormann, left, load his animals into a trailer near Colorado Springs as they evacuate the area June 24. 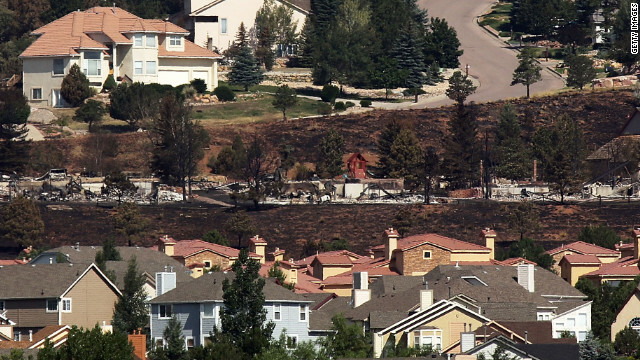 The High Park Fire, which was 45% contained as of June 23, has destroyed 191 homes west of Fort Collins. 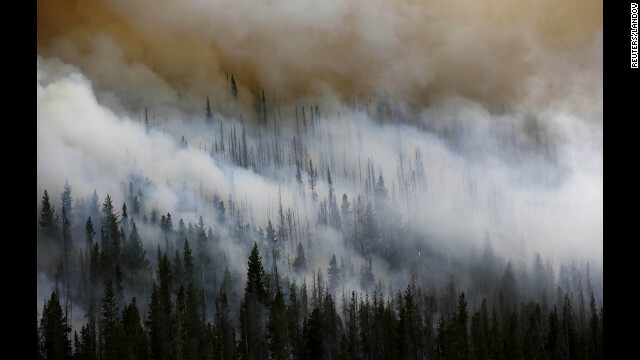 The High Park Fire rages through the forest west of Fort Collins, Colorado, on June 19. 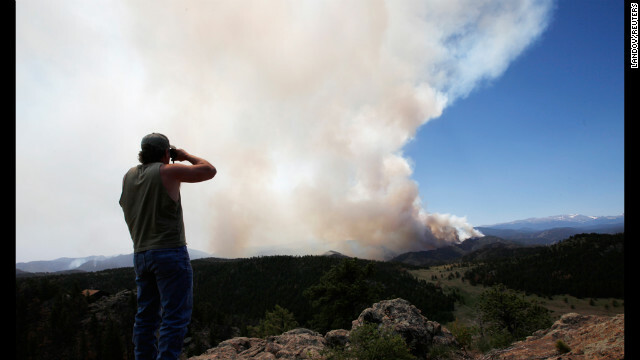 Local resident Dwayne Crawford looks out at the High Park Fire from his home west of Fort Collins on June 19. 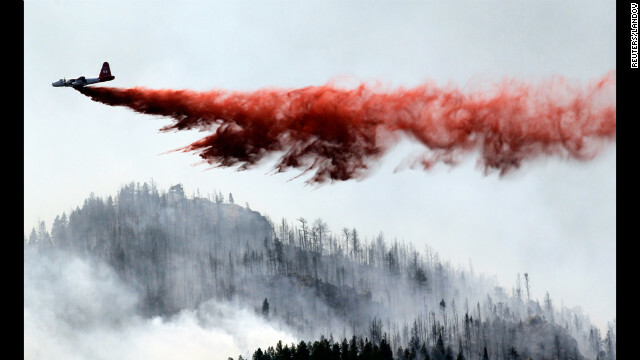 A heavy air tanker drops fire retardant on the blaze June 19. Its growth potential was "extreme," according to authorities. 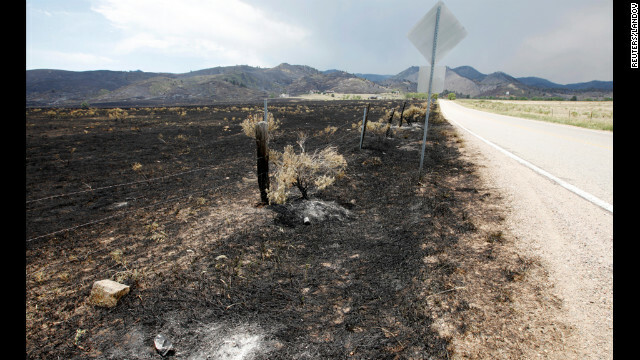 Flames scorched this area outside of Fort Collins where the High Park Fire has burned out, June 19. 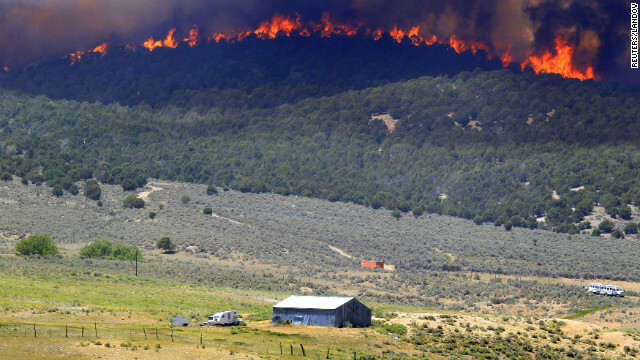 A wall of fire makes its way down a hillside toward a farm north of Fairview, Utah, on Tuesday, June 26. 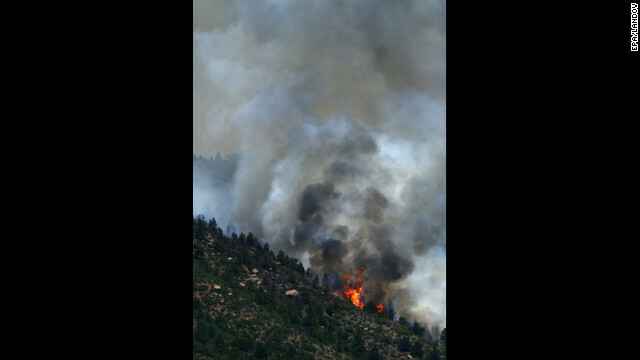 The Wood Hollow Fire, one of at least three wildfires burning in Utah, has grown to nearly 39,000 acres. 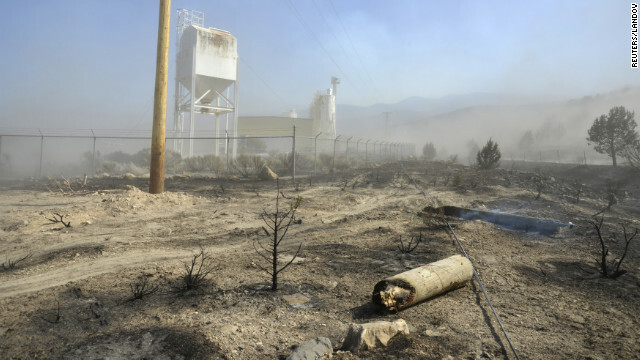 Smoldering earth and damage from the Dump Fire, which began June 21, can be seen outside a plant near Saratoga Springs, Utah, on Saturday, June 23. 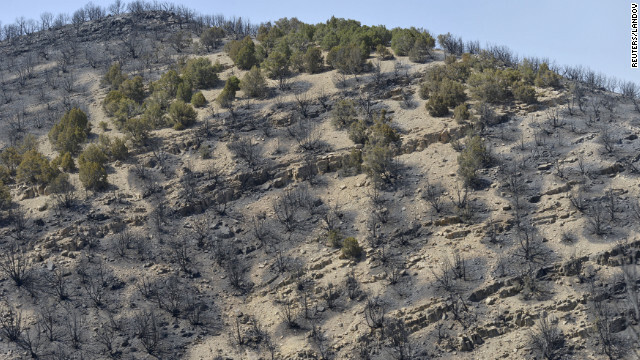 Burned-out terrain from the Dump Fire fills a hillside near Saratoga Springs, Utah on Saturday. 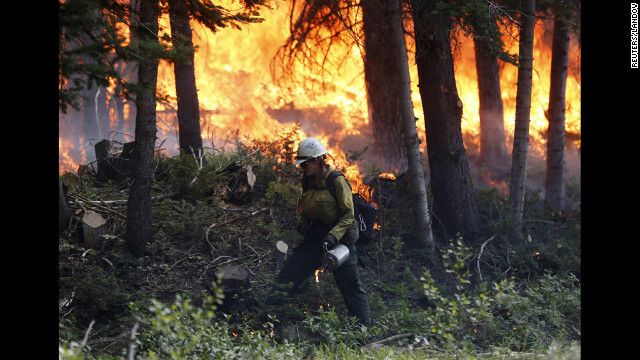 Are wildfires blazing near you? Share photos and videos with iReport, but please stay safe. 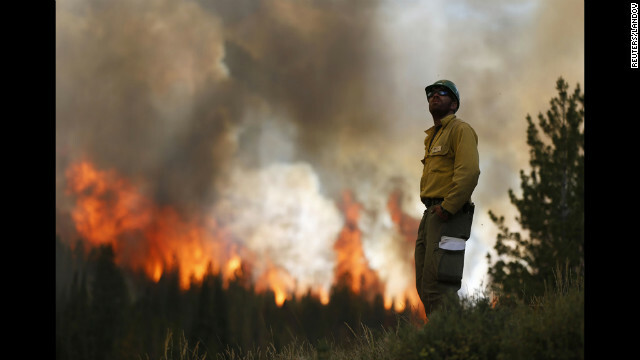 (CNN) -- Firefighters made progress Thursday in fighting a blaze that has devoured more than 18,000 acres in Colorado, but their sense of accomplishment was tempered by the news that nearly 350 homes in Colorado Springs had been destroyed by the flames. Mayor Steve Bach, citing preliminary numbers, told reporters that 346 residences on 34 streets were destroyed. 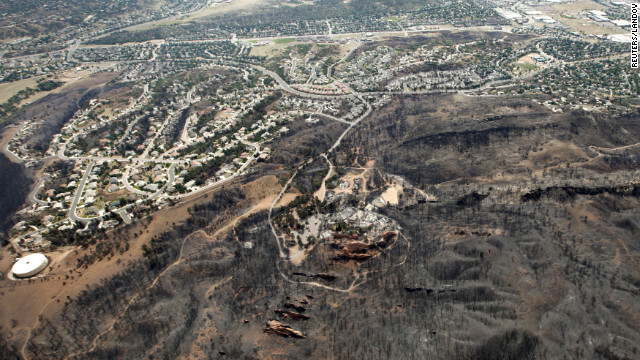 A meeting was planned Thursday night for residents of specific streets affected by the Waldo Canyon Fire, Bach said. "This is going to be a tough evening, but we're going to get through it," he said. "This community is going to mount an unprecedented response to this. ... This community is going to surround them with love and encouragement, and we are going to move forward as a city." The blaze, which has chased 36,000 people from their homes in the city, was estimated to be at 10% containment, incident commander Rich Harvey said. 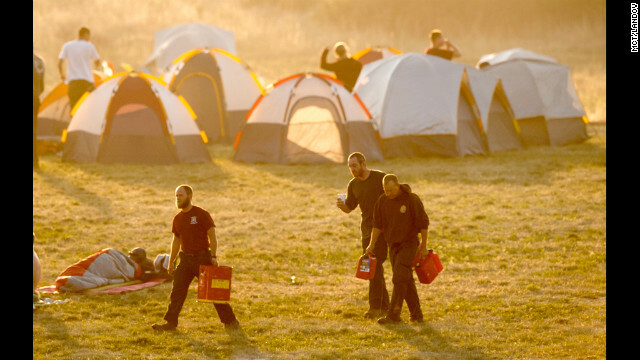 Calmer winds and lower temperatures Thursday helped firefighters in fighting the blaze. 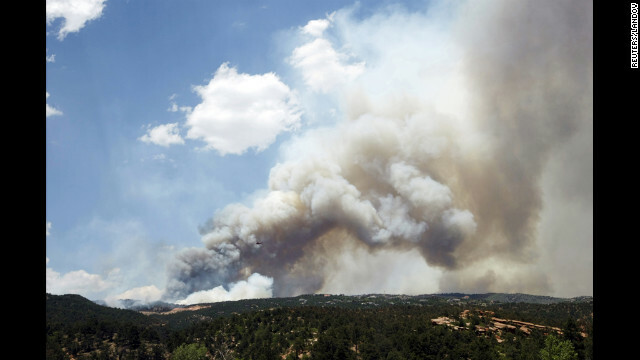 "The weather cooperated with us today like it has in no other day since this fire started," said Jerri Marr, forest supervisor of the Pike and San Isabel National Forests and Cimarron and Comanche National Grasslands. "We made significant progress today." Still, she warned, "There's a lot of fire out there on the ground." The U.S. Forest Service has estimated it could be mid-July before the fire is fully under control. Colorado Springs Police Chief Pete Carey told reporters, "There's a small number of people we're trying to track down," attempting to determine which evacuation center they might be in and whether they left notifications for relatives. Those number fewer than 10. A secondary search of the destroyed homes would be carried out Friday, authorities said, to make sure no one remained inside. 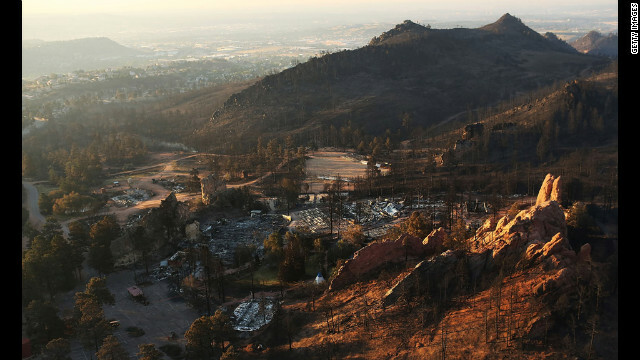 The Waldo Canyon Fire captured attention because of its proximity to landmarks such as Pikes Peak and the U.S. Air Force Academy, and also to Colorado Springs, a city of about 400,000, the state's second largest. The Flying W Ranch, a Western-style tourist attraction in Colorado Springs, burned to the ground. President Barack Obama will travel to the area Friday to survey the damage and thank responders battling the blaze, the White House said. Bach said he welcomed the visit. "I really appreciate the president coming here ... if nothing more than just to reassure us that this a focus at a national level, that there are people all over this country who are concerned for our citizens and those who have lost their homes," he said. "And I do plan to ask for cash." The Denver office of the FBI, meanwhile, has joined local authorities in investigating reports that an arsonist might have set the fire. "It infuriates me and it just makes my blood boil," Colorado Gov. John Hickenlooper said at the thought of arson. "It creates a physical reaction in me ... to think that there's someone out there, because they get some kick ... there's some joy that they get (from setting a fire)." Defense Secretary Leon Panetta received a briefing Thursday from NORTHCOM commander Gen. Chuck Jacoby "on the status of Defense Department support" to the wildfires, Panetta's office said, and instructed Jacoby to continue to provide assets to the extent they are needed. Hickenlooper on Thursday announced the creation of a relief fund to benefit those affected by the fires. 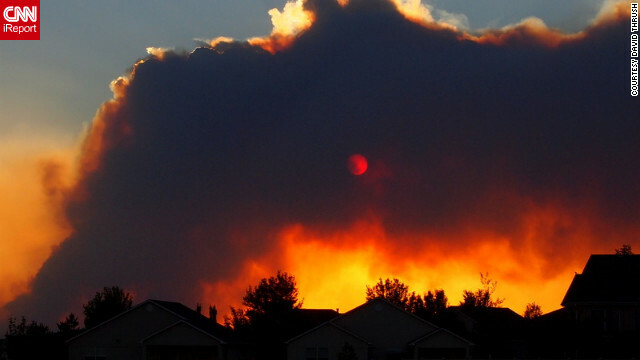 Colorado Fire Relief Fund 2012 will assist all communities affected by fires this year and will complement ongoing fundraising efforts online. More than $600,000 in relief support has already been donated, the governor's office said. Individuals can text "fire" to 80000 to donate $10 to the efforts, and several events are planned to benefit the fund. Carey said police in Colorado Springs have been "inundated" with phone calls from residents wanting to return to evacuation zones. "It's really something we can't do right now, to any further extent," he said. One frustrated resident showed up at Thursday's press conference on the fire. A Colorado Springs landmark known for its remarkable geological formations remained closed until further notice. Garden of the Gods so far has escaped fire damage, said Bonnie Frum, director of operations for its visitor and nature center. 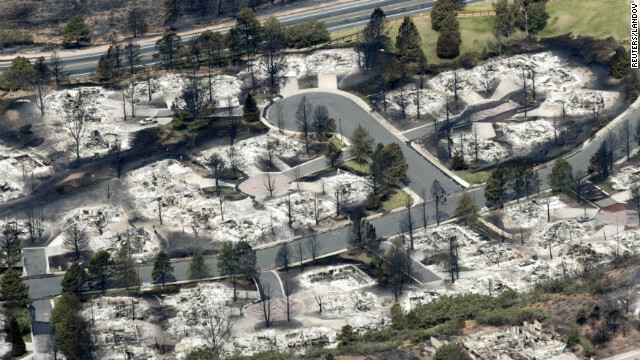 But the blaze did reach homes only a few blocks north of the park, she said. "This is the biggest tragedy our city has ever had," said Frum. "We have a perfect storm going here. A drought with no moisture in the winter. We didn't get a lot of snow. Then the winds and the low humidity. You put it all together, and boy." She and others said many tourist draws in the area remain open, including Royal Gorge Bridge and Park, Seven Falls and the U.S. Olympic Training Center. The forecast in the coming days will be somewhat kinder to firefighters. 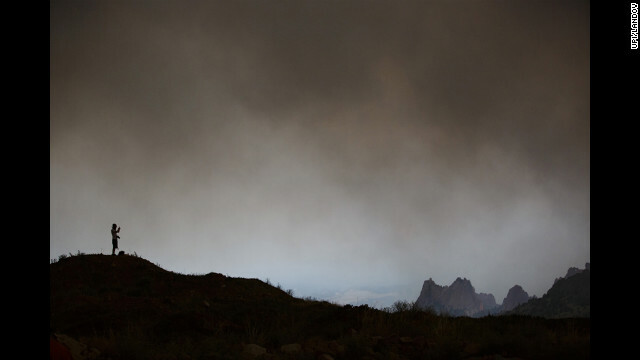 Temperatures are expected to cool into the lower 90s with winds of no more than 10 mph -- a far cry from the 65-mph gusts Tuesday that whipped the flames through mountain canyons and past containment lines. The scale of the fire is such that smoke blankets the sky 40 miles to the north, Castle Rock resident Heather Gardner said. "It's just really devastating to see that landscape completely charred and people's homes lost," she said. "I pray for that community and the rescue workers involved in keeping everyone safe." The inferno has been a challenge even for some of the country's top firefighters -- sometimes getting the best of them. "We have rehearsed and practiced disasters," said Dave Rose, public information officer for El Paso County, which includes Colorado Springs. "We have never seen one like this before." The bone-dry conditions may make the Fourth of July holiday less festive for many Coloradans. Fireworks displays in Jefferson and Douglas counties -- to the south and west of Denver -- have been canceled. With tens of thousands of state residents out of their homes, the Denver Broncos pledged $50,000 to relief efforts for the wildfires. "This is our home, and we need to do whatever we can to take care of our neighbors," team owner Pat Bowlen said. "If at all possible, I encourage our fans to help however they can in providing relief during this time of need." 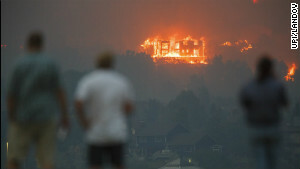 Richard Brown, the Colorado Springs fire chief, called the Waldo Canyon Fire a "firestorm of epic proportions." Stan and Darlene Colbert were among the last families in the evacuation zone to pull out. They waited, hoping the fire would subside, but after watching the flames from their back porch, they knew it was time to go. The first things the couple -- married 43 years -- packed were the family photos. "Every one of them I could find; every photo, because I can't replace those," Darlene Colbert said. The flames came dangerously close to the Air Force Academy's main campus, burning about 10 acres of its southwest portion before it was contained, the academy said Thursday. More than 600 families living on base and 110 dormitory residents were evacuated, and more than 600 cadets were relocated, the academy said. About 375 were released to sponsor families, and another 200 were residing in dormitories at the University of Colorado-Colorado Springs. 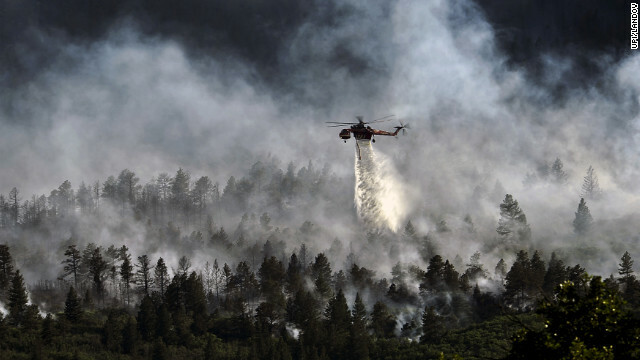 The academy's powered flight, glider and parachuting operations have been called off since Saturday so the U.S. Forest Service could use runways for helicopters fighting the fires along Colorado's Front Range, according to spokesman John Van Winkle. However, the academy's Class of 2016 -- all 1,045 cadets -- arrived as scheduled Thursday, and in-processing and basic cadet training began, the academy said. Colorado wildfires had consumed 181,426 acres by Wednesday afternoon, according to the Colorado Division of Emergency Management. The largest of the fires was the High Park Fire, which began June 9 and has now consumed 87,284 acres, the U.S. Forest Service said. It was 85% contained Thursday. The total number of homes burned stood at 257. An estimated $36.4 million has been spent trying to contain the blaze. CNN's Phil Gast, Moni Basu, Ashley Hayes, Ed Payne and Jim Spellman contributed to this report.